While I was on the Stockroom website I looked around at other things too. I found a beautifully made tawse. I was so excited to find it. Tawses are old school implements that teachers in England and Scotland used to discipline children. They are usually made from one single piece of leather with a handle. The long slapper is split down the middle and looks something like a tuning fork in shape. The split is supposed to give it a distinctive sting. This one has a handsome pattern stamped on the handle. It is very nice, very quality-made. Daddy asked me to look around in Scotland when I was there for a tawse. I never found one. I researched them and found out that they stopped using them in schools decades ago. So, I was doubly excited to be able to fulfill this desire. The Bison leather made the new flogger quite a bit heavier than his cowhide floggers. 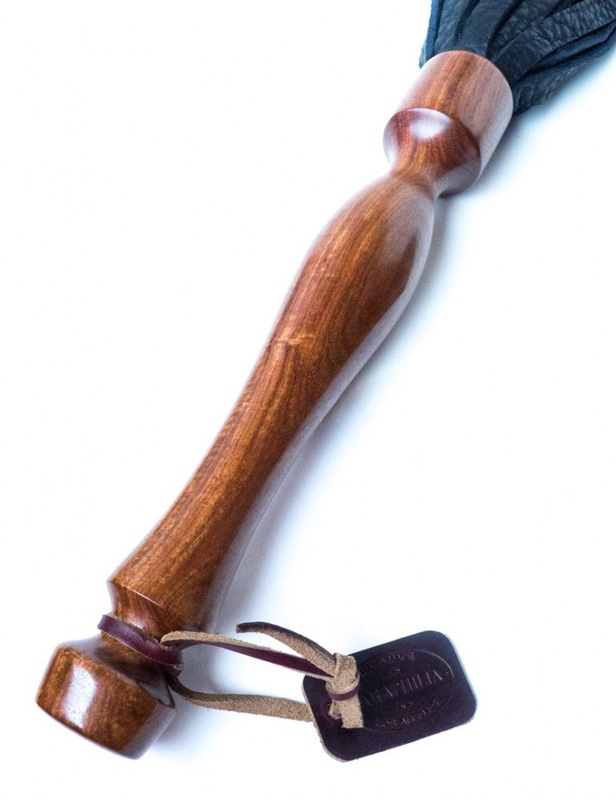 It also has a smooth and shapely Granadillo wood handle. I loved the feel of it and really hoped he liked using it. When we got to the house and unpacked I tucked both toys under my side of the bed for the right time to give them to him. Monday came and after our errands and lunch Daddy said he wanted to beat me. “Is that alright with you?” He asked. “That sounds perfect to me Daddy.” He knows I will never turn down play time. It is my absolute favorite pastime. I knelt on the floor on my side of the bed at his feet. “I have a surprise for you Daddy. I wanted to give you something to celebrate the beginning of our life here in this new place.” I brought out the flogger first and then the tawse. He was very pleased with both of his gifts. “Thank you very much baby girl. If you want to play now, go present yourself.” I rose from his feet and went into the spanking room.